LNMU Exam Date 2019 has been available. Students can check LNMU Time Table from this page. 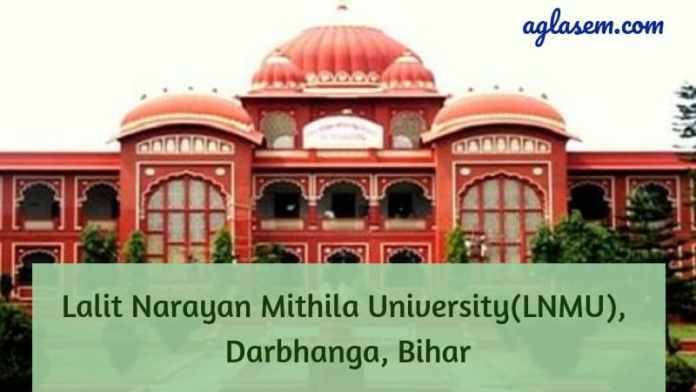 Lalit Narayan Mithila University has released the LNMU Date Sheet for UG Part 3 Exam 2019. The University is conducting BA, B.Sc, B.Com Part 2 Exam 2019 from May 08. The exam will continue until June 07, 2019. The students who put the minimum required attendance will be eligible to appear for the exam. The eligible students have to submit the exam form and fee on or before the last date. LNMU releases the admit card for the eligible students. Check the page for LNMU Exam Date 2019. Latest: Lalit Narayan Mithila University has released the Exam Date for BA, B.Sc, B.Com (Hons./Gen./Sub/Voc) Part 2. Als, for LNMU Admit Card 2019 – Click Here. Lalit Narayan Mithila University UG Part 2 Exam will be conducted in two sittings ie, 1st and 2nd sitting. The 1st will start from 10 AM and 2nd sitting from 02 PM. Students can check LNMU Time Table for the exam date, time, sitting, exam centre, subject code, and name. Check LNMU UG Part 2 Exam Date below. How to check LNMU Exam Date 2019? Students appearing for the university exam can check the exam date above. To check the exam time table students can follow the steps mentioned below. The university allows the eligible students to appear for the exam. All the eligible students have to submit the exam application in the prescribed form with the fees. The exam forms must be submitted before the last date. No application will be entertained after the last date. Students submitting the form successfully will be allowed to write the exam. Lalit Narayan Mithila University releases the admit card for all the eligible students. Students can download the admit card online. Students appearing for the exam must download the admit card to appear in the exam. No students are allowed to write the exam without the admit card. Students are advised to get the signature and seal of the principal of the college on the downloaded admit card. Downloaded Admit Card without the seal and signature of the principal will not be considered valid. Below are few instructions to be followed by the students appearing for the university exam. Mobile phone and any other electronic gadget are not allowed in the exam. If found the items will not be returned back. A student found involved in malpractice will be booked under the unfair means of the exam and shall not be allowed to write the exam.